Today, Rockefeller Center is a fascinating combination of contradictions: at once futuristic and classical, with soaring buildings and underground tunnels, inspired by both hard-headed commercialism and philanthropic idealism. Below street level, the Center's buildings are linked by a pedestrian shopping concourse. This is an oasis of order in the heart of the busiest city in the world, a city within a city, functionally efficient and aesthetically elegant. 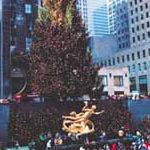 In 1988, Rockefeller Center was declared a national historic landmark.